When you think of dogs how can you not think of a dog barking? Dogs and barking kind of go hand in hand but I was astonished to learn that there are some quiet breeds out there. And although they’re not completely silent, there are dogs that don’t bark too much. The afghan is one beautiful canine! This is a highly intelligent breed that will find a deep bond with its family. Excessive barking isn’t a part of this dog’s agenda. This breed from Japan (portrayed in the movie “Hatchi: A Dog’s Tale”) is demanding and requires respect from every family member. It’s known for its lack of nuisance barking but don’t let their quietness fool you – a burglar will not appreciate the loudness of the Akita’s bark if a break into your home is attempted! Akita’s are nicknamed the “Silent Hunter” and they regard themselves as pack leaders. This is a well known bark-less dog that does something unusual when it becomes excited – no, it doesn’t talk! 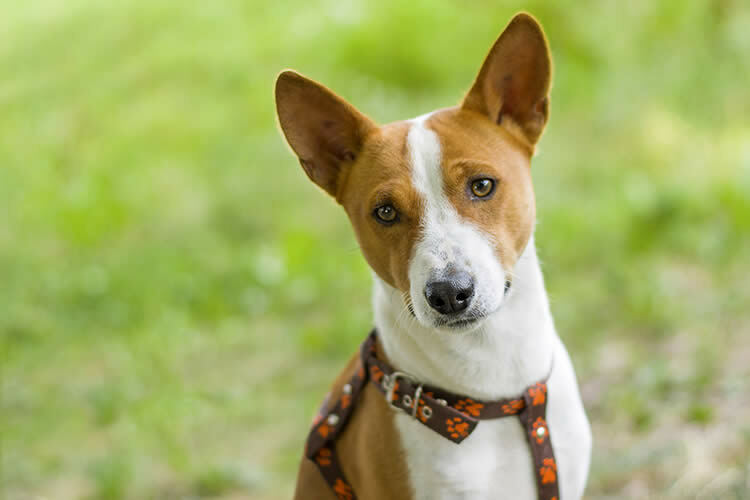 The Basenji actually makes a yodeling sound! This is a high energy dog that can be very entertaining (and exhausting) at times! This patient sheepdog is very large and lovable. Bred to be patient and quiet, these dogs are not altogether pacifists as they tend to be protective and stubborn. When necessary they can become aggressive. Beautiful and graceful is this breed that’s typically well-mannered and quiet. But it needs a lot of exercise because it loves playtime! Always depicted as the mascot for the Marines, the Bulldog is a gentle and lovable pet. Excellent with the family, the bulldog won’t annoy you with unnecessary barking. Known as that “wrinkled dog” this breed is a quiet pup that’s very devoted to its owner. When danger is near or when at play is the only time you’ll hear this dog bark. This is a large cuddly canine that doesn’t look as if it has the strength to bark! This is the largest of the spaniels and it really doesn’t bark unless danger is near. Dalmatians tend to be a quiet breed if they are properly trained and socialized. But they do know when to bark and that’s when barking serves a purpose! Ignore them and they will bark…annoyingly. The Great Dane, however, is a large pup but not a large nuisance barker. Considered a very fast dog that has run many races in its early years. Now tired, the greyhound just needs a loving family. He’s a loyal companion who doesn’t think he needs barking to improve his life. This giant canine breed, doesn’t excessively bark but it does eat, and eat, and eat and sleep on your most favorite comfortable chair. But what can you do – you love him! This breed is pleasant and quiet. Also child-friendly and not prone to barking. Socialization can aid this dog with its nervousness and aloofness, which are their traits. This giant breed of dog has been bred to be docile and dignified. They are big enough to keep trouble away and peaceful enough to be a family loving dog. As pups, they’ll bark when playing but this is something they’ll grow out of. Adults seldom bark except when greeting, guarding, or investigating. This breed’s name sounds more like a dragon right out of the wizarding world of Harry Potter instead of a breed of dog but the Rhodie is an exceptional hunter, ready to defend its family! This strong, silent dog loves outdoors and exercise but it also cannot wait to curl up on the couch alongside its master as it awaits cuddling. When exercised, this breed will be calm and quiet. The Saluki is beautiful but a high energy dog that will run after anything it sees move! What did you expect? Holding in a bark has to have an adverse effect somewhere else! Talk about a dog that doesn’t bark. This breed may not even bark if someone is at your door! They’re very quiet when inside but outside where there is a chance to hunt some prey, they tend to be a bit on the wild side! So when a pup, keep a tight reign on this breed’s leash! Very calm are these dogs while inside as they are content just to sleep. They’re not known for barking or even growling and are good dogs that love kids. They’re also speedy runners that need socialization so they can live and play nice with pets other than dogs. Not That There’s Anything Wrong With Barking! A barking dog shouldn’t necessarily be seen as a bad thing. With proper training many dogs can learn how to curb their barking behavior. Barking is part of a dog’s nature, a form of communication they use between their own species and their human friends. I’m not sure I’d like barking silenced completely but I know one thing – I’d love to hear that yodeling dog!